For this edition of our Then and Now series, we’re diving into an often overlooked and misunderstood watch model: the Rolex Oyster Perpetual Date model. Sometimes confused with the larger Datejust or the manual-wound Oysterdate, the Oyster Perpetual Date is, in fact, its own collection. It is also one of the oldest Rolex models still in production today. Let’s compare the first Oyster Perpetual Date vs the current and most modern iteration to see what this watch is all about. 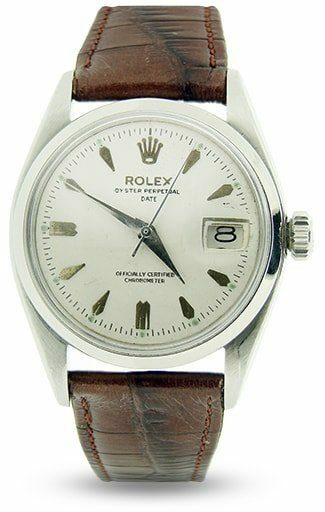 The very first Rolex Oyster Perpetual Date made its debut in 1956/1957 as the Oyster Perpetual Date ref. 6534. It’s important to note that while the Rolex ref. 6518 did come out a few years prior to that, the ref. 6518 is considered a transitional reference since Rolex was experimenting with different names such as Oysterdate Perpetual or simply Oyster Perpetual without a mention of “Date.” So for the purposes of this article, the first official Oyster Perpetual Date is the Rolex ref. 6534. The Oyster Perpetual Date, ref. 6534, featured a stainless steel 34mm Oyster case. This was classified as “boy’s size.” Notice that the Oyster Perpetual Date is 2mm smaller than the Datejust (which came out in 1945). Fitted onto the Oyster case is a matching steel riveted Oyster bracelet. There are several dial variations of the Oyster Perpetual Date ref. 6534. However, the most common one we’ve come across is a light colored dial with silver-toned faceted triangular indices and alpha-style center hands. Naturally, as a “Date” model, there’s the essential date window at 3 o’clock. This also includes the Cyclops magnification on the acrylic crystal. Some versions of the Oyster Perpetual Date ref. 6534 have a “roulette” date wheel, alternating between red and black numerals. Also on the dial, note the “Officially Certified Chronometer” label. This refers to the Caliber 1035 powering the watch. As the name of the model suggests, the COSC-certified chronometer Caliber 1035 is an automatic (i.e. perpetual) movement and it operates at 18,000 beats per hour. In the mid-2000s, Rolex unveiled the latest version of the Date with the Oyster Perpetual Date ref. 115200. The first thing you’ll notice is how similar the first Rolex Date and the most current Rolex Date are in appearance despite the six decades that separate them. The Rolex Date ref. 115200 also sports a 34 mm steel Oyster case and matching steel Oyster bracelet. The dial layout remains uncluttered and legible with simple baton hour markers, straight center hands, and a date window at 3 o’clock. Naturally, the Cyclops lens is still there, but this time affixed onto a sapphire crystal. There are a few dial color options available on the OP Date ref. 115200 including white, silver, pink, blue, and black. Now carrying the familiar “Superlative Chronometer Officially Certified” designation on the face of the watch, the Oyster Perpetual Date ref. 115200 runs on the famed Caliber 3135 automatic movement beating at a frequency of 28,800 bph and offering 48 hours of power reserve. It’s clear that Rolex understood they had produced a solid model with the very first Oyster Perpetual Date. This is a given since the most current version bears an uncanny resemblance to that maiden watch. 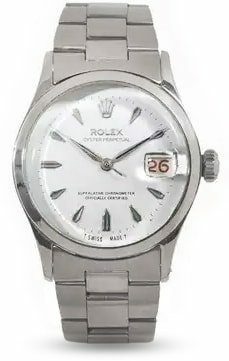 Despite the fact that the Oyster Perpetual Date is not as well known as many other Rolex models, it does fill an important void between the no-date Oyster Perpetual watch and the larger and more expensive Datejust watch. And that is precisely why the Date 34 is still going strong over 60 years later.